Product prices and availability are accurate as of 2019-04-21 07:29:06 UTC and are subject to change. Any price and availability information displayed on http://www.amazon.com/ at the time of purchase will apply to the purchase of this product. 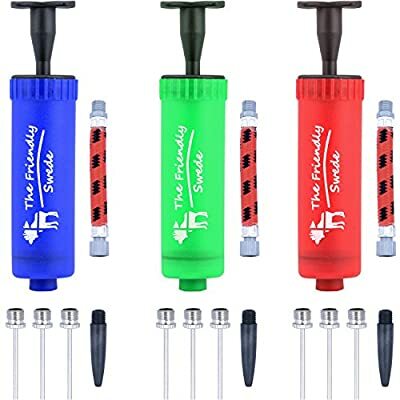 Competitive Edge Products is delighted to offer the famous [3 PACK] Ball Pump Kit - Includes 3 Pumps, 9 Inflating Needles, 3 Flexible Hoses, 3 Plastic Adapters for Exercise Balls, Inflatable Toys and More - Lifetime Warranty. You can keep your sports balls and inflatables pumped up and ready to go - pumps are suitable for volleyballs, footballs, basketballs, Bosu balls, yoga balls, inflatable pool toys, airbeds etc. Product has a hidden needle compartment in the pump head to avoid needle damage when not in use. Note: this does NOT fit the plastic tapered nozzle. A removable flexible rubber hose makes pumping easier, quicker and safer and minimizes the risk of damaging needles. Also comes with 9 inflating needles and 3 plastic tapered nozzles that allow you to pump balls and inflatables with larger valves. Item is 6'' long, so it easily fits inside any bag. BUILT-IN NEEDLE STORAGE: hidden needle compartment in pump head to avoid needle damage when not in use.